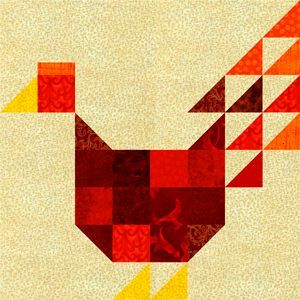 The patchwork chicken quilt block pattern creates a scrappy quilt block that finishes at 12" x 12". Quick piecing methods help the chicken block go together quickly and easily. Avoid stripes and other directional fabrics, a tone on tone fabric works nicely; the background includes a variety of differently sized patches -- label them with dimensions or the designated letter to help during assembly. Most of the 2-3/8" squares are used to create half square triangle units (two of the red or orange squares are not). Some people like to cut squares for quick pieced half square triangle units oversize, and then trim back the sewn unit to its exact size after assembly, especially when working with small squares with little room for error. Instructions for the patchwork chicken quilt block use quick piecing methods that I've written several times, and that many are familiar with, so won't go into great detail here. Refer to the linked instructions if necessary for assembly. Find the 2" x 5" background bar (B). Draw a line on the reverse side of the bright yellow 2" square. Align the square at the bottom of the bar, right sides together. Use the quick pieced Snowball corners method to sew the square to the bar in the orientation shown. Clip and press as directed in the linked instructions. This is also the same method often used to make quick pieced flying geese. Sew a contrasting 1" x 2" rectangle to the top of a 2" red square, followed by the 2" x 3" background bar (C). Press seam allowances either direction. Ignore the 5" x 5" background square that's shown for now (G), but keep it handy. Draw a diagonal line from one corner to the opposite corner of the back of each 2-3/8" background square (J). Use the quick pieced half square triangle unit method to pair each marked square with (3) red or orange squares of the same size and the remaining bright yellow square. Trim-back instructions are included in the tutorial for those who assembled oversize units. When complete, you should have (6) red-orange/background half square triangle units and (2) yellow/background units that each measure 2-1/2" x 2-1/2". Cut the remaining 2-3/8" x 2-3/8" red or orange squares in half once diagonally to produce four triangles. One triangle will not be used. Gather three of the 2-1/2" half square triangle units assembled above. Arrange the three half square triangle units into three rows, along with the triangles you just cut (placed along the diagonal as shown). Sew components of each row together with a scant (just a tiny bit narrow) quarter inch seam allowance. Press patchwork in adjoining rows in opposite directions and then join the rows, matching seams carefully. Cut background piece H, a 5-3/8" square, in half once diagonally. Sew one of the triangles to the unit created in Step 5. The other triangle is not used. Arrange all patchwork for the top of the chicken as shown, bottom. Sew components together. Press seam allowances either direction. Keep the 3-1/2" x 8" (A) background bar handy. Take a look at the center portion of the drawing -- it's assembled in sections that are then sewn together. For the top of the middle row, use the Snowball tips technique again to sew a 2" red square to each end of the 2" x 6-1/2" background bar (F). Note the angles. For the next section, arrange (8) 2" x 2" red and/or orange squares into two rows, each with four squares. Join the squares in each row. Press seam allowances in adjoining pieces in opposite directions and then join the rows. Press. For the lower section, begin with (2) 2" x 3-1/2" bars. Use the Snowball method once more to sew a red or orange 2" square to the top end of each bar -- the two outermost units of the row. Notice that they are mirror images, with angles oriented in opposite directions. Okay, we're almost there. Sew the last two 2" red or orange squares together side by side. Sew the background/yellow half square triangle units together side by side to create the critter's feet. Press seam allowances in the rows in opposite directions and then join the rows. All portions of the row's central area can now be sewn together as shown in the bottom image. Press. Refer to the top image again, right column. Sew two red or orange half square triangle units into a row. Sew the remaining half-square triangle unit to the left side of the 2" background square (I). Press seam allowances in opposite directions and join the rows. Sew the 3-1/2" x 5" background piece (E) beneath the patchwork unit. Press. Join all three sections as shown, bottom, and on the next page. Press. Join the two portions of the quilt block, matching edges and intersecting seams. Press. The quilt block should measure 12-1/2" x 12-1/2". It's easy to make a mirror image patchwork chicken by flipping some units and sewing others in mirror image configurations. This image of the chicken will help you arrange components.